Yesterday on Instagram, I saw that Bonnie Hunter was doing a Quilty Christmas Projects Link-up and I thought, how fun!!! I don't know if I have ever done a Christmas Project Round-Up post, and what better day than Christmas Eve ;) So here it goes. These are the Christmas Projects you can find here at Happy Quilitng. I made 3 Christmas Projects this year . . .
First, O Christmas Trees. For more fun pics, I blogged about this quilt here. And if you want to make your own, the tutorial for this quilt can be found here. Second for this year, my Simply Modern Monochromatic Stockings. Finally, we all have matching stockings, yippee!!! For more fun pics, I blogged about these stockings here. And if you want to make your own, the tutorial for these stockings can be found here. And the final Christmas Finish from this year, My Christmas Fat Quarter Fizz that was made with the Fat Quarter Shop. For more fun pics, I blogged about this quilt here. And if you want to make your own, the pattern for this quilt can be found here. Then pop back another year to when I was first finding the online quilt world. 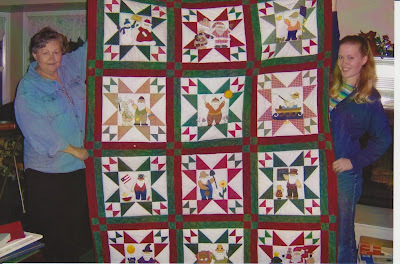 In 2010 Amy Ellis was hosting a Beginners Sampler Quilt Along and I made a Christmas Version. So fun!!! For more fun pics, I blogged about this here. And that just about wraps it up. Yup, my first quilt ever is the last one to be shared ;) I have to say, I am so glad Bonnie did this little linky. It really is so fun to see all of these in one place. I hope you find a quilt or project you like that you want to whip up for next year ;) If you do, I would love to see it. You can add pics to my flickr group here or email me pics at happyquiltingmelissa@gmail.com. So that is my little Christmas Project Round-up :) And now I best go round up the kids to go sledding. Have a very Merry Christmas and a Happy Holiday!!! Merry Christmas! What festive quilts! So many beautiful quilts...that first quilt is quite amazing for a FIRST! Merry Christmas to you and your family! They're all so pretty! Isn't it fun to look back at everything you've accomplished over the years? Merry Christmas to you and your Family! I love all the Quilty Christmas posts being shared today. Mine is mixed with a bit of my Nativity collection. I hope you and your family have a wonderful Christmas and your lives are filled with blessings in the coming year. some lovely makes here have a lovely time with all the children can just picture Christmas morning in your house! Thank you for showing all the lovely Christmas projects and links to the tutorials. Merry Christmas! Merry Christmas from a meltingly hot Queensland, Australia! Here, we all had the flu and it was quiet.